Exposed vie ferrate, lonely mountain tours, alpine climbing, or sports climbing - in order to enjoy all these different realms to the full, safety measures must be taken. The necessary equipment depends on the type of activity: Ropes, helmets, quickdraws, or via ferrata sets. Hip belts are a basic requirement. Why do I need a hip belt? Enormous forces develop when you're falling. A climbing harness must withstand these forces and spread them over different parts of your body in order to absorb the shock and minimize the risk of injuries. When you're hanging on your rope freely, the belt should stabilize your body without stopping your blood from circulating. 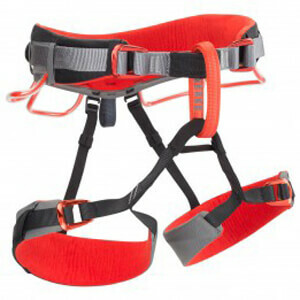 So-called sit harnesses and hip belts have become the most common climbing harnesses for they provide maximum freedom of movement and comfort. At the same time, they have proven themselves safe even though these harness systems don't cover the upper body (unlike full-body or chest harnesses). Therefore, a sit harness must fit perfectly: This means, the harness should fit tightly so it won't slip over your hips while stabilizing you reliably. Apart from a fitting harness, weight and padding are further selection criteria to be considered. What does a hip belt look like? Hip belts consist of two loops for your legs connected by a stem. There is another loop for your hip. The stem and the hip loop are connected by the so-called belay loop. As the name indicates, the belay loop is to be connected with the belay rope. In the case of hip belts, this connection point is almost consistent with the center of your body. This can become a problem when the body center lies above the connection point. In this case, the hip belt does not provide sufficient protection anymore. Perfect safety - Hip belt or full-body harness? However, this safety risk is manageable. Adults will only get into such a situation in case of a shift of their center of gravity, i.e. when carrying a backpack or if they are obese. Children, on the other hand, require additional protection: Their proportions are different and their body center changes depending on their body's growth stages. Moreover, their hips are not fully developed, which means the sit harness will slip over their hip bones more easily. In these cases, a hip belt is not safe enough. However, it can easily be combined with a chest harness, which is considered to be the safest existing belay system.